This is what we mainly did on the trip home. This was definitely not the case going over. Then much time was spent with pointy little hammers that we used to chip the paint off the bulk heads so they could be repainted. Also on the way over the weather was mild. We took a southerly course around Britain, stopping in Southampton overnight. We then steamed up the English Channel, over to Germany, and up the waterway to Bremerhaven. 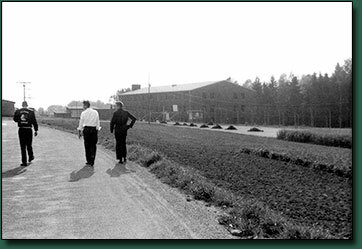 From there most took a train down to Stuttgart, then were dispersed out to our various units. The first part of the trip back was an experience. 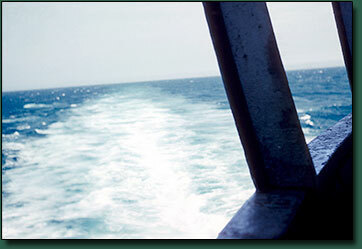 Our course took us up into the North Sea and around the northern tip of Britain, and this time the weather was rough. Known for its weather, the North Sea was rockin' and rollin'. We were kept off deck and down in the cramped bowels of the ship with rows of rope stretched canvas bunks six or eight high. Keeping your food down was the challenge, although I didn't get seasick like some of the others did. 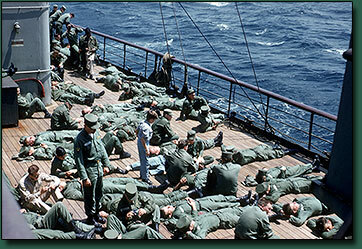 It was welcome relief when we were allowed on the rain and wind swept decks, breathing in large volumes of fresh sea air. I did think, how did those old submariners do it. There is no experience that parallels being out in the middle of one of our planets great oceans. The immensity of all almost beyond comprehension. There was such a purity about the water, I always had this great desire to be immersed in it. And that pull was strong and ever present, a very spiritual experience. On a more mundane level, after we swabbed the decks with our mops, with them being a dark gray with dirt, the sailors had a natural solution to cleaning them. They tied special series of knots that kept a hold of the long handles, they would then toss them over the aft end of the ship letting them trail along in the water. And after about 5 minutes or less they would haul them back on deck, and those mops were pure white clean. I remember being quite impressed and amazed by that event. The things we remember...! 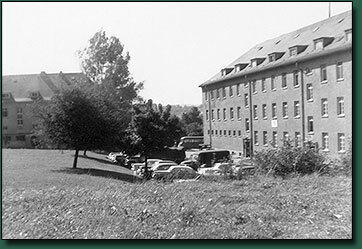 After getting off the ship in Bremerhaven, and an overnight train south, my first station was Gerszewski Barracks in Karlsruhe. As I remember the Armory was in the basement, and the person in charge of it was Corporal Pea, from Tennessee. We became friends and I convinced him to issue me a 45 caliber submachine gun, known as a “Grease Gun”, as my weapon. It was actually kind of a funky weapon, and not too accurate after a short distance, but it was light, easy to clean, and a novelty. 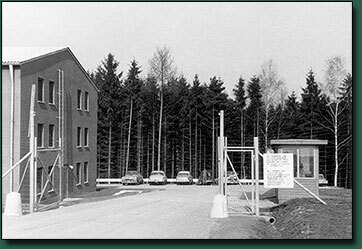 The most intense experience I had was actually living in barracks that were occupied by former WW II soldaten. I really could feel the energy and karma of the period. As I probably has said I have always had a sense of place and historical context, but that time was particularly intense and something I have never forgotten. The echoes of jack boots on the cobblestone streets, or coming up and down the stairways was always in my head. 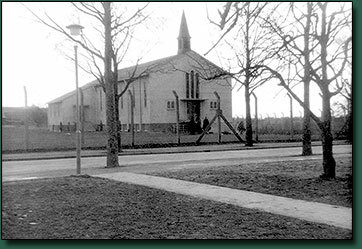 Most of the guys who were chosen to man the new Charlie Battery at Kleingartach were first stationed at Gerszewski Barracks. Married personnel often had their families join them. 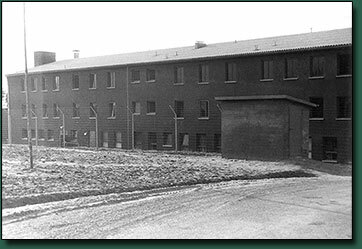 Some lived in military housing on post, and others found apartments in the surrounding communities. 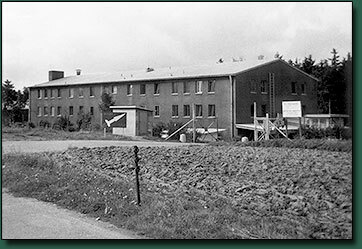 Gerszewski also had buildings that housed battery shops like Assembly, Motor Pool, etc which were located up around the barracks, with the Launching Area down in a marshy area located in the surrounding area. The Butler Family has provided a number of photos that illustrate those early times. One is of the Butler Family arriving at Gerszewski, and the other is of Master Sgt. 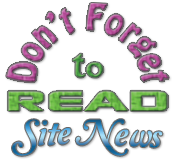 Butler down at the shops, so “Click Here”, and be sure to maximize the browser window for best viewing. I don't know who the other NCO in the picture is, so if anyone knows who he is please let me know. A variety of their photos can be seen throughout the web site. Also, to view the inside of a Gerszewski shop area “Click Here”. This photo is the battery's Assembly shop area. 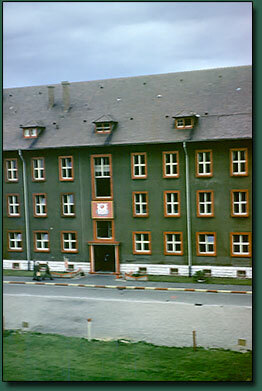 Wharton Barracks was in Heilbronn. To get on overview of Wharton and the Heilbronn skyline beyond “Click Here” to view a period postcard included in a group of images provided by the Butler Family. For an optimal viewing experience remember to maximize the browser window when the PDF opens. 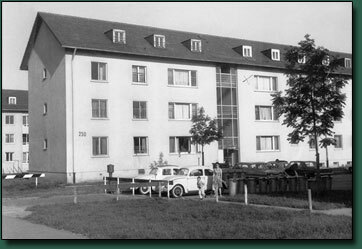 X marks the spot of The Ohearn's third floor apartment next to the stairwell in this block of Officers Housing located at Wharton Barracks in Heilbronn. Also in the foreground is Charles' wife Dominique keeping an eye on their son as he plays in the front of the building. Horace Reed (left) and Leo Brach (middle) heading back after being on pass. This is the entrance to the Charlie Battery Barracks, Headquarters, and Motor Pool areas. It was always manned 24/7/365. I never pulled guard that this post, but I'm sure it wasn't easy, being open to such scrutiny and activity. I don't remember that it was ever closed like the Launching Area and IFC, but that doesn't mean that it wasn't. It makes sense that after a certain time in the evening the OD closed it. You can “Click Here” to view an interesting comparison between yesterday and today.